There is much debate going on about what principles the United States of America was founded. Was it founded by a bunch of capitalists who just happened to be moralists? Or, was it founded on Judeo/Christian principles that were established thousands of years earlier in the Bible? You would think this would be a no-brainer, but somehow atheists (and others) have their own version of why there are so many references to God and the Bible in the early writings and lives of our founding fathers. In his book, The Book That Made America: How the Bible Formed Our Nation, Jerry Newcombe sets out to prove that our nation was indeed founded on Christian principles, and it is those same principles that we’ve strayed away from. 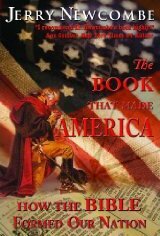 The Book That Made America: How the Bible Formed Our Nation (Nordskog Publishing) by Jerry Newcombe is a definitive volume on the Christian roots of our nation. Those who want to restore knowledge of our Christian heritage have their work cut out. As secularism continues its stranglehold on American education, we move further and further away from retaining our Christian roots. The Book That Made America will challenge anyone to know the true origin of our Nation and to fight to keep it. Newcombe hopes to educate Americans by providing the facts of history, proving that America began as a Christian nation and American’s have every right to preserve and uphold that heritage. All that is positive in our foundation can be traced back to the Scriptures. Recently, President Obama declared that America is not a Christian nation, while Newsweek announced the demise of Christian America. This book is the answer to America’s critics with the facts of history. You can win a free copy. I have one copy to giveaway to someone. Leave a reply stating why you think this book would be a good read and I’ll pick one entry to send a free book to. Jerry Newcombe, D. Min., is senior producer for Coral Ridge Ministries and has produced or coproduced more than fifty documentaries. The host of two weekly radio shows, he has also been a guest on numerous television and radio talk shows – including Fox Business News, C-Span, USA Radio and Moody Radio. He is the author or coauthor of twenty two books, including with Dr. Kennedy, What If Jesus Had Never Been Born?, How Would Jesus Vote?, and The Presence of a Hidden God. Sounds like a good read Roy. I think its curious that the list of those praising it didn’t include David Barton of Wallbuilders, seem like his kind of book. Last time I checked the library 5000 Year leap had over a years worth of holds on it so I been looking for something else to read..
i think your book is relevant to our nation building in the philippines. we have been praying and interceding for the philippines for the the past 20years we are about to leave our babylon.the 490 yr shift is about to happen after we were discoverd by spain in 1521. God is about to make a shift in our nation from wickedness to righteousness. next year a man of God Bro Eddie Villanueva will run for presidency. i am a co founder of the intercessors for the philippines(ifp)..we have started to put the foundation of righteousness and justice(ps89.14) in the 8 pillars of society.your book will give us insight on how the word brought the US to prosperity. we are praying that we can overcome the impediment to our call as a blessing to nations one day..i have have been looking for books like yours. include me as one fr the raffle.if it still ok. Thank you for the comment. Unfortunately, the book has already been sent out. John won it. The book is excellent and can be bought at Amazon.com.